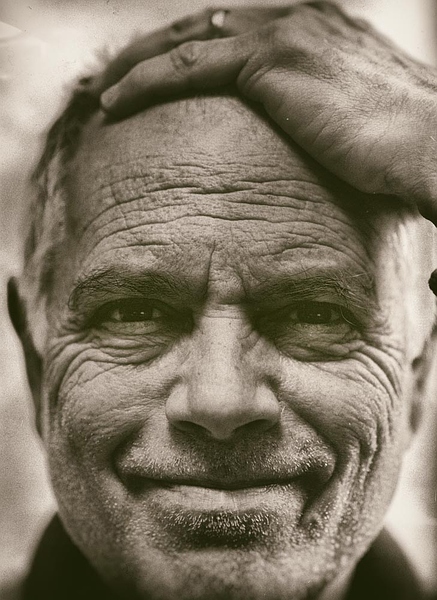 David Wolk will tell you that he doesn’t believe in all his own opinions, but in this case, his excitement about his new collection of photographs is shared by people in a position to know. “I will never walk on sand the same way again,” they say. And now he has blown the whole thing up. He took the suggestion of his friend Richard Wilde at the School of Visual Art and massively enlarged each of the series to four feet by seven, just to see what would happen. When working on 10964 for which David does layout, he and I meet in his office, a tiny room filled with the accoutrements of his publishing business and two very large dogs. But this time, we went into the dining room, a large, comfortable room painted a clear, light blue, like the sky on a summer’s day, with a sideboard, some other furniture, and a dining table with matching chairs. All pretty unexceptional, except for the purple bath towels covering the table. Because my attention was taken by the towels, David asked me to turn around and there on the wall behind me was a larger-than-life photograph showing rivulets of water receding with the tide over a bed of sand and pebbles. This description, though accurate, fails to capture the mesmerizing image in all its moody sensuality. Somehow David gets very close to the surface and in such a way that doesn’t magnify as a microscope would, so it’s not as though you see teeming life among the sand particles that you couldn’t see at the usual height; rather you become aware of a spectral beauty that wrestling with wind, flies, mosquitoes, and whatnot distracts you from when you yourself are walking on the beach on a stormy day in Maine. The viewer might call his work abstract except that the image is real; it is not deconstructed. What you are looking at is the geometry of nature in motion. David has been photographing since he was a teenager. His first job was in high school, photographing sports events. When he won the Cherry Blossom Festival award in Belleville, New Jersey, the Belleville Times hired him for a dollar a picture to take sports pictures and then the Nutley Times called for the same. So many of his photos were regularly published that he was given a “raise” of ten dollars a week. David has always had relationships with artists but didn’t consider himself one until he started shooting the sand series. 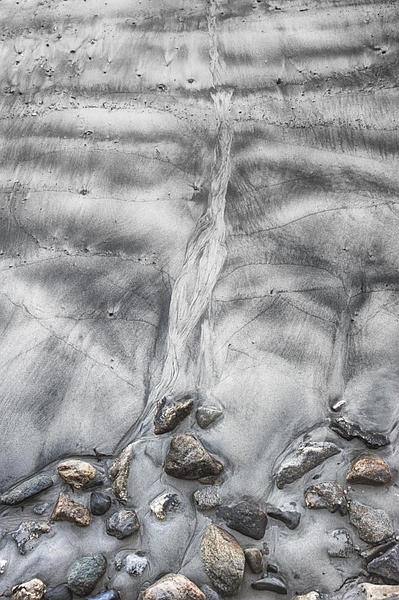 Over the course of four years, he photographed two beaches in Maine that spoke to him in a way that his previous subjects hadn’t. When he exhibited this new work at the Goldsmith Gallery in Boothbay Harbor, people ignored his earlier photos, chatted with each other, spilled wine, and so on, but in front of the sand images, they stopped to stare in silence. David waits with his camera however long he needs to get his picture. He walks very quietly, attentive, present. Not always knowing exactly what he’s seeing, he shoots his photos, and develops them, not inventing anything that isn’t there, but bringing out what it was that he saw through the lens. David furled the towels, one at a time, revealing as he did so a stack of photographs the size of the table top. The problem now, he explained, is to find the wall space on which to hang them. When he does find it, he will post the time and location on his website, www.davidwolk-photography.com where you should go to see for yourself what happened to David on that beach in Maine. As he walked me out, we passed some of the original shots hanging in the hallway, versions the usual size, and it was striking to see how enlarging them did not produce just a bigger photo, but a different photo, still beautiful, and emotionally intact, with a new and commanding presence.